Apartment living is about to jump in Scottsdale as a growing number of new complexes near completion, while others begin construction. The first units of various new complexes are available for leasing in the southern, central and northern parts of the city. 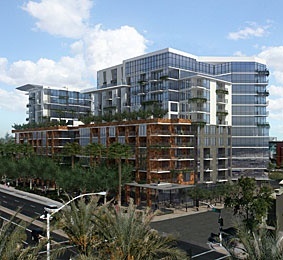 One high-profile apartment project, Gray Development Group’s Blue Sky, however, has yet to come out of the ground since it was approved by the City Council in April 2011. The site is on the eastern side of Scottsdale Road, just north of Camelback Road and across from Scottsdale Fashion Square.